Me and my husband married 15/07/16! So happy we’d asked John to be part of the day! We had so many comments on his singing and was such good professional performer! Not only that really good personality and sense of humour, chatting to our guests and haveing a dance with the bridesmaid! Really helped make our day special and you can tell he enjoys what he does and is good at what he does! I would recommend to all for any events you may have going and I’m already thinking of using John again on an event next year! So thank you again John! Many Thanks for doing NYE for us at Chesterfield Football Club and agreeing to come back again this year after some great feedback from our customers. May I wish you all the success possible for 2016. John is the consummate professional entertainer. His international performing reputation ensures his popularity with all clients. Enough is to say you will be completely captivated by his virtuoso presentation and delighted that you made an excellent choice whatever your special occasion. John gave a fantastic performance at our grandparents’ 60th wedding anniversary. A true professional with a sensational voice! Thanks so much John! Thanks again John for singing at my parents Golden Wedding Celebration yesterday, Having spent ages researching a swing singer, I can honestly say I could not have been happier and i,m really pleased that I booked you. 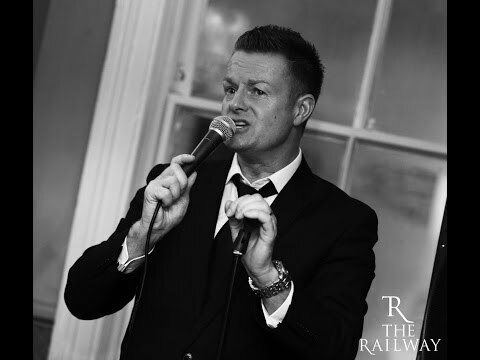 All our guests were hugely impressed with your voice and enjoyed your rapport with the audience. i can not recommend you highly enough and wish you well for the future. Thank You. And you are a great singer and trumpet player John. Also, congratulations – you have won the longstanding unclaimed prize of £50 for mentioning THREE of our bands which you have fronted. I think most people are ashamed to admit having worked with all three – some mention one, most mention none at all. Thanks for this – it is greatly appreciated ! Will share your promo on the 9 pages I manage ! Great player, great singer, great bloke! Highly recommend him for any event large or small. Great site and great singing John! I would definitely recommend John he is a fantastic talent and handsome too!! Looks Good John great site ,Love your playing TOP MAN . A lovely guy and fabulous entertainer. John is a great singer and musician ! A great guy, a great singer and artist, professional all the way. Nice one John Moakes. Bing sounds good Too! © 2019 John Moakes. All Rights Reserved.